By now the Denver Convention Center is probably cleaned up from IOUG Collaborate. The signs directing thousands of attendees to top-notch technical presentations have been removed, the twenty rental laptops which composed the classroom for Pythian’s RAC Attack class have been returned and the vendor exhibition floor has been completely cleared out. Flight delays notwithstanding (thanks to some midwest weather), attendees are generally home by now – even those coming from places as far away as Germany and Australia. Now that the buzz is dying down, I’ve finally found a few minutes to post my personal highlights. First off, my favorite part of Collaborate is the opportunity to meet so many old friends and make new acquaintances who are all using Oracle technology. It’s both fun and informative to hear about the ways others are using Oracle software. One person deserves very special mention: this was my first time hanging out in person with my Australia-based colleague Yury Velikanov. You could hear Yury’s deep-chested, enthuiastic “Pythian” chants even if you were on the opposite side of the exhibition hall from our booth. His sense of fun and relentless demands for silly faces during photos were so unresistable that anybody within about thirty feet of him was affected. 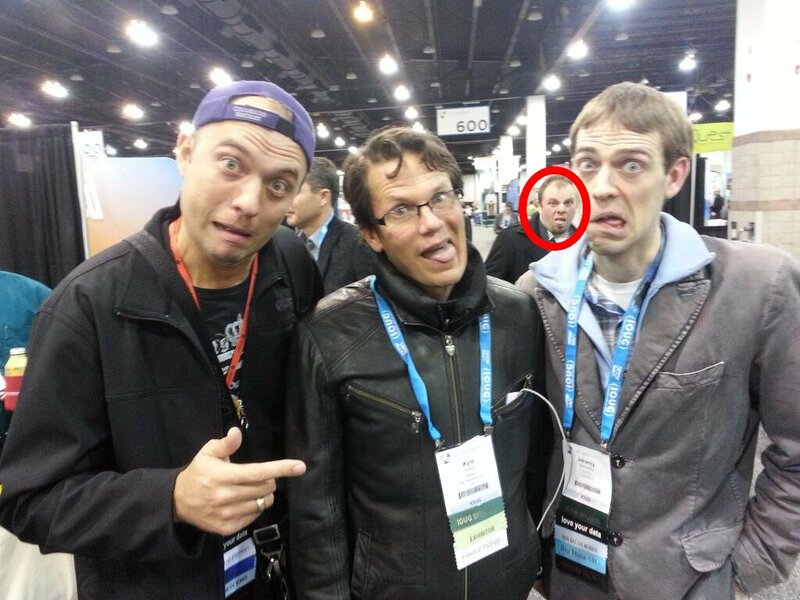 In the photo below, notice how the guy standing behind me has also made a silly face for the picture. I wasn’t able to attend many technical sessions simply because I was so busy with the RAC Attack classes but the two I did attend didn’t disappoint. Craig Shallahamer‘s session Practical Performance Forecasting for the Oracle DBA was excellent. He compared benchmarking, simulating and modelling for performance evaluation and then took a deep dive into best practices for creating and using models. He discussed a variety of potential input sources in depth and walked through practice exercises on a theoretical consolidation case. Finally we wrapped up with a brief discussion of the queueing theory. Excellent material! If I had to choose one take-away which I think was the single most important point, it would be this: R = S + Q. Every DBA should know what this is referring to on a basic level. If you don’t know what I’m referring to, then I’d recommend Craig’s class – or any of Cary Millsap‘s talks for that matter (they both cover this very well). Frits Hoogland‘s session How Oracle Secretly Changed Multiblock Reads is a must-see presentation for DBA’s with any interest in database internals. With the aid of operating system traces and debuggers, Fritz has dissected the Oracle database kernel’s I/O process and compiled an incredible summary report. Showing surprising differences between recent releases of Oracle RDBMS, Fritz dispels any myth that they aren’t making major changes to the database engine. However, despite unmatched technical depth and quality, my favorite part of this session wasn’t technical. At one point during the presentation I remember Fritz saying that he ran a test and was completely baffled by the output. While trying to problem-solve himself, he also fired off a few emails looking for feedback from others. An email from a colleague pointed him to the “total number of slots” statistic, which led to an “ah-ha” moment and explained the data he was seeing. This was my favorite part because it made me feel much better about asking for help myself, since someone as smart as Frits asks for help sometimes too! The bulk of my energy this week was dedicated to the RAC Attack class. First off, I am excited to announce a major development for RAC Attack: we have re-introduced printed textbooks. Two years ago we stopped printing textbooks – when the curriculum was moved to wikibooks in order to better support broad collaboration in creating the best beginner RAC curriculum available. Last week we completed and released the process for creating a printed textbook from the wikibooks content. The process is completely automated. You start up an EC2 instance and run a little code which lives at github; shortly after this you get a PDF which is ready to go to the printers. The 250-page textbook has over 200 screenshots. In the USA, I’ve had them printed in the past for US$30-40 each. This should go a long way toward supporting instructors who want to teach RAC Attack classes. Information about the textbooks is at http://racattack.org/book. In addition to this, there have been a number of improvements to the organizer’s guide over the past few months. Anyone interested in organizing RAC Attack events can find a good deal of helpful material on the Events wiki page. We’ve learned a lot through the many events we’ve run in the past! We had 15-20 people gather in the foyer area for the initial kick-off. Everyone listened to the description of the RAC Attack project with interest and some stayed to try starting out with their personal laptops, while many decided to attend one of the two later classroom sessions. We occupied most of the available tables and we were a very noticeable crowd as everyone passed by from the keynote to find technical sessions to attend! We filled the classroom sessions. There were no major technical problems with lab machines as people worked through the labs. There were many good conversations; I remember in-depth discussions about listener architecture in 11.2 RAC (with SCAN) and about init parameters related to client connections and about services and about applications which require all connections to be made in a single instance. There was significant positive feedback about RAC Attack. One guy stopped me as I was entering the exhibition hall Monday night just to tell me that that he had learned more in the RAC Attack class than any other session thus far at Collaborate – he was visibly pleased with the experience! Collaborate was a memorable conference this year. I’m very thankful for the hard work by the IOUG leadership to put this event together! If you attended Collaborate then make sure to pass along your thanks and any other feedback to IOUG! And whether or not you attended – support your local user group; they are a crucial resource and tremendous asset to all of us. For those of you who attended Collaborate, what were your favorite technical sessions or keynotes? What other parts of the conference did you find valuable? Leave a comment here to tell us what you thought about Collaborate!